Located in the heart of the Veneto countryside, Crosato is just thirty kilometers from Venice and Padua and is surrounded by charming Veneto towns such as Cittadella, Bassano, and Treviso, all within easy reach. This exclusive historical 16th century Venetian villa is elegant and sophisticated, yet at the same time comfortable and inviting. The furnishings are a mix of family treasures, period paintings and interesting art. The floors are stone and parquet and bathrooms are decorated with lovely hand-painted Vietri tiles. Within walking distance of the villa is a village with a grocery store and coffee bar and the surrounding towns have charming restaurants and trattorias. Wonderful grounds, including a classic Italian garden with fountain, Greek mythicfal stautes, large flower beds, lawns anda 7 hectares park fully enclosed and framed by a forrest of well established hardwood trees and evergreens. Enjoy a peaceful walk past the orignal dove house, chapel and fish pond with running water. A separate garden with swimming pool and pool house with gazebo is surrounded by roses, hydrangeas and oleanders. As a guest of Crosato, not only will you enjoy the accommodations of the villa, but also the warm hospitality of its owners. They live in a separate part of the villa and can provide expert local advice on day trips and restaurants. From the villa's ground floor entrance, marble stairs lead to the first floor landing. On the left is a double bedroom suite with its own sitting room with sofa and a bathroom with shower and tub. On the other side of the landing are a dining room, fully equipped kitchen, and a beautifully furnished living room. An impressive wooden staircase leads you up to the second floor where there are three additional bedrooms : a double bedroom with a queen size bed a walk through closet that leads to the en suite bathroom with a shower and tub, another double bedroom that has a queen size bed, beautiful family heirloom, antique writing desk and chars, and a comfortable upholstered chair. Off of the living room is large twin/double bedroom with there upholstered chairs for relaxing before bedtime. The second and third bedrooms share a bathroom with shower and tub which is located just off the living room. All of the bedrooms have spectacular views of the rest of the villa and the formal gardens. Outside, there is a private flower garden with a swimming pool, gazebo and barbecue. 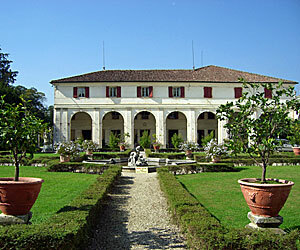 The spacious grounds include an Italian garden in the front of the villa and an English garden in the back. The villa is surrounded by flower beds and woodlands, including a chapel and a fish pond.